In what is literally one of the more unusual promotional campaigns to have been seen in recent years, comes the timely return of Sydney's food festival season, and with it the March into Merivale Food and Wine Festival. Autumn in Sydney is now undoubtedly the start of food festival season, but while the end of summer is still a while off yet, the Merivale group is well prepared for the impending festivities. So what exactly is March into Merivale? In summary, the unique event is a month long extravaganza of food and drink related events. That includes dinners, lunches, food markets, wine tastings, chef competitions, cooking classes and of course desserts. Each event has a quirky theme to keep guests entertained, and more often than not foodies are given the opportunity to interact with some of the best chefs and sommeliers within Sydney. 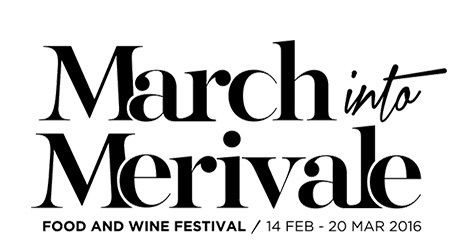 This year's annual food and wine festival will run from February 14th until March 20th, with all the fun starting with the now famous March into Merivale Launch Party on Wednesday February 10th. The launch will take place at ivy from 5:30pm, and include Ivy Pool Club, Ivy Ballroom as well as Ash Street Laneway. Each unique space will feature a plethora of pop-up food stalls representing Merivale's extensive portfolio of restaurants and bars. The concept provides a great opportunity to sample each venue without having to run around town. Foodies can also expect special guests, music and live entertainment. Restaurants that will be on showcase at the launch will include The Beresford, Felix, Vinnie's Pizza, El Loco, Ash St Cellar, Palings, Sunnee's, Ms.G's, The Fish Shop, Coogee Pavilion, Lorraine's Patisserie, Papi Chulo, Bistrode CBD, Mr Wong, Mr Wong dim sum, sushi e, est., The Paddington, Uccello, Coogee Rooftop, Palmer & Co and J&M. There will also be a preview of upcoming venues. These include The Newport, Fred's and Queen Victoria Hotel's Queen Chow. Entry to the launch party will require a $45 investment. This provides foodies with 8 food and drink tokens, which are the essential currency for the food stalls and bars. A range of food and wine related events will also take place over the month, spread across Merivale venues around Sydney. Each will range in price and offer a unique experience for attendees. One notable mention is an event called Wine Not? Guests will join award winning winemaker Josh Hammond from New Zealand winery Villa Maria and sommelier Franck Moreau, as they reveal their favourite wines from the cellar. The event will christen Merivale's new stylish bar J&M. Canapes will also be on offer at this special wine tasting opportunity, but the privilege will set you back $45. The wine tasting will be held on February 22nd. Another event called #Instaskillz will be the first of it's kind. The class will feature instagramer Justin J. Wee as he shares his tricks on how to get jaw dropping pics. Guests will also include Ms. G's chef Dan Hong and Papi Chulo chef Patrick Friesen. The event to be held at the Subtype Boutique store will cost $45 and include refreshments as well as a makeshift studio and backdrop to test out your Instagram skills. Check out Justin's profile at @djdumpling to see if it's worth your while. The class will be held on February 29th. The Between the Buns event to be held at Palings will no doubt be a fan favourite. In a miniature version of what resembles the famous Battle of the Burger competition held in New York, guests will get to chose which Merivale chef makes the best burger. The winner will not only claim bragging rights, but also a spot on the menu for the entire year. From dozens of entries spectators will get to try six of the best, with the list of finalists to be announced on February 1st. The event will set you back $45 and include six food and drink tokens. If only the event also included non-Merivale venues from around Sydney. Then they would be on to something big. The competition will be held on February 17th. The event Mystery Feasts will add an element of mystery to your dinner plans. All guests have to do is pick the time, and Merivale will pick the place. Picking the $75 dinner package will set you up with a three course dining experience at either Mr Wong, sushi e, The Paddington, Bistrode CBD, Felix, est, Uccello or Ms.G's. A mystery lunch option is also available for $35. Chocoholics will be out in force at the aptly named event Chocsessive. Guests will join dessert chef Lorraine Godsmark for a lesson in all things chocolate. The class to be held at Lorraine's Patisserie will cost $75 and allow foodies to sample to their hearts content while they enjoy some bubbly. The class will take place on February 15th and March 14th. The European Laneway event along Ash Street will also be making a comeback, along with the Coogee Pavilion Foreshore Festival. The later is a wacky beach carnival that will provide fun for the whole family. There'll be roving entertainment, face painting and even balloon animals, which are sure to keep all the little kids and big kids happy. Food will be aplenty from the Pavilion and the way to the Rooftop, with special appearances from Papi Chulo, El Loco, Mr. Wong and the amazing sushi e. A $45 fee will set you up with six food and drink tokens, which are the currency for the day. European Laneway will take place on February 24th at 5:30pm and 7:30pm, while the Foreshore Festival kicks off on March 20th. Merivale will also be bringing back its incredibly social long table events, starting with A Night in Paris on March 10th. The French themed dinner experience will take place under the stars along Ash Street Laneway, while foodies sample creations from chefs Ben Greeno and Nathan Johnson. Currently performing the culinary arts at The Paddington and Felix respectively, Greeno has recently come across from uber eatery Momofuku Seiobo, while Johnson made his reputation working in London. Guests can expect rotisseries rolling out succulent roasted chicken, French wine and copious amounts of delightful desserts that would make the French proud. The dinner direct from France will set you back $200. Taking overindulgence to the next level will be the All Pleasure, No Guilt long table dining event on March 3rd. This black tie affair to be held at est. will feature hatted chefs including Peter Doyle of est., David Lovett of Uccello, Nobuyuki Ura of sushi e, Nathan Johnson of Felix, Dan Hong of Mr. Wong and Ms.G's, Jeremy Strode of Bistrode CBD and Paul Donnelly of Ms.G's. Expect an elite level of silver service with white gloved staff catering to your every whim. Dom Pérignon will be sponsoring the event, where guests will be able to select from a plethora of options including Dom Pérignon Vintage 2006, Dom Pérignon P2 Vintage 1998 and Dom Pérignon Vintage Rosé 2004. The five course, nine hatted dinner will cost foodies $300 per person. Finally, the Bubble with Guilt event is all about surreal Champagne tasting. Guests can expect a highly decadent affair at the Hemmesphere lounge, with canapes to go with the large range of champagnes, all while being fanned by models carrying oversized feathers. The staff will even be serving your drinks on gilded mirrors, all while you reminisce about times less grand. The wine tasting event will set you back $85. For more details on all the events and dinner deals, as well as tickets to the launch party, visit MarchIntoMerivale.com.au. Why? Entertaining food and wine events across Sydney restaurants and bars for over a month. When: Starting February 10th and going until March 20th. Where: Merivale restaurants and bars across Sydney, with the launch at ivy in the Sydney CBD. Cost: Prices vary depending on the event, averaging around the $45 mark. Check the website for more details.